Study underway to determine the exact cause of the erosion and best long-term solution. 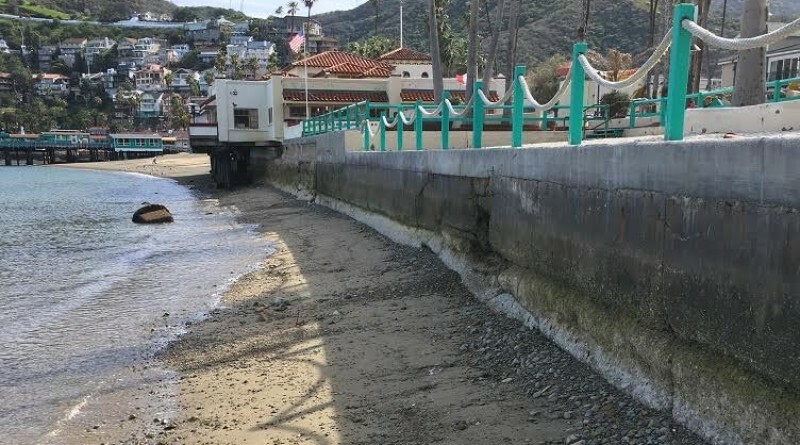 AVALON ― As Southern California continues to get pounded with stormy weather, Catalina Island focuses on repairing the seawall in Avalon Harbor. Recent weather conditions resulted in Avalon’s aging seawall going from bad to worse, according to city officials. Seawalls prevent too much sand from spilling into the bay and making it too shallow for boats. Seawalls need to be maintained in order to remain effective as a division between land and sea. “The city’s seawall in the harbor needs to be repaired (and maybe replaced in portions) because of shifting waters that are undermining the foundation of the wall,” Jinkens told The Log. Before repairing the seawall, a study is underway to determine the cause of the erosion. Once the reason for the deteriorating seawall is determined, recommendations can be proposed as to how best to repair and/or replace portions of the seawall. The city of Avalon authorized Michael Baker International to conduct the study, which has already begun. The cost of the study is $49,000, according to Jinkens. The results of the study are expected to be reported in approximately two months. Avalon city staff would then need to secure further funding from state and federal grants to pay for the repair work. “The city’s desire is to see appropriate repair and/or replacement work done, and the sand that once existed at South Beach returned there,” Jinkens said.